The critical variable in this process: Can your session leaders truly engage attendees? "It takes real work to put sessions together that meet the informational objectives in a way that's compelling to your learners," says Max Anderson, director of instructional design and learning innovation at the University of Illinois' College of Medicine. "In the world of formal education, we teach the teachers by making them practice things out. Associations don't have that same opportunity." Nonetheless, associations can effectively guide their presenters towards more interactive formats, and then get presenter buy-in by helping them prepare to execute those formats. "I think most business presenters are unfamiliar with formats other than what they use, and they worry that they cannot pull off a new format successfully," says Bob Kiser, associate director of the Graham Clinical Performance Center at the University of Illinois' College of Medicine and an expert in experiential learning. "Give presenters the most assistance you can on how to use a different format" and you will strengthen the quality of your sessions this year, and in subsequent years. One thing Anderson encourages associations to is something that's also popular now in post-graduate education: Backward design. In short, "you're asking presenters exactly what they want the learner to take away, and then figuring out how to meet that in the best way," he says. "This often results in a session moving from being presenter-focused to attendee-focused." One way for associations to guarantee that such a conversation happens with all presenters: Don't send the PowerPoint template to a presenter until it's decided that PowerPoint is the best way to deliver the bulk of the session's information. "A presenter must know what that session's attendees need and want before deciding on a format, even if the presenter is a topic expert," Anderson says. For many sessions, "you simply have to deliver more than you did before," Kiser adds, "things like frequent attendee interaction and exercises, which use presented information as a jumping-off point to get participants to discover perspectives and answers from each other." 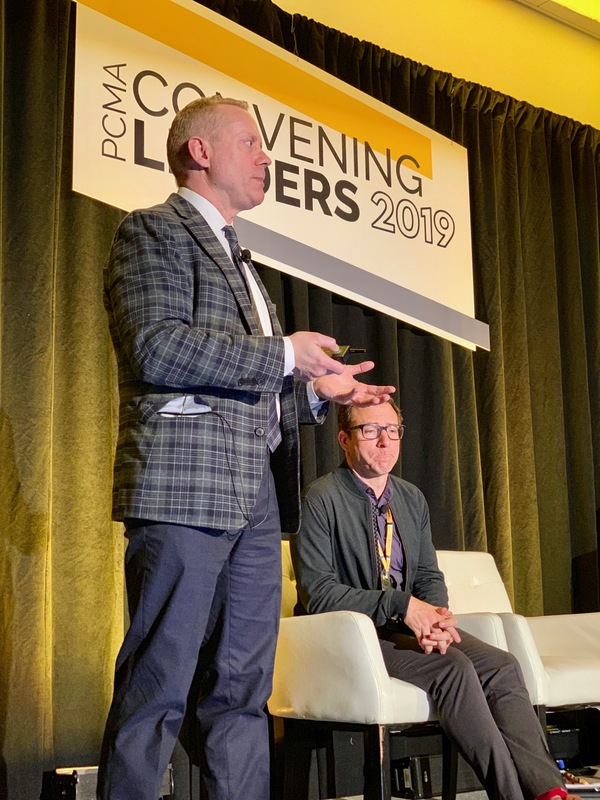 Max Anderson and Bob Kiser educated meeting planners on effective session formats at PCMA's Convening Leaders conference in January. To spur presenters down new paths, Anderson suggests conducting an online session several months ahead of the event to introduce and demonstrate different formats the association thinks could work for its attendees. "Provide basic, intermediate, and advanced versions of a 'teaching the teachers' session so that all your presenters feel comfortable with some type of change," Anderson says. "The basic version could show how to use polling tools at regular intervals to guide the direction of the conversation, while the intermediate can show how to get attendees to work in small groups for ten minutes and then present their results to everyone." And for the advanced version, Kiser says that he has seen "escape room" formats introduced, whereby attendees collaborate to answer questions in order to obtain clues so they can figure out how to get out of the room before time expires. This format uses the same framework for succeeding in business situations: making useful connections between data points, hearing different perspectives, prioritizing ideas to act upon, and beating deadlines. Kiser adds that it's easy to show video snippets of interesting formats the association has used in prior years, and explain to presenters why each format works for particular objectives. "Once you do that, you can say to each presenter, 'Here's what our attendees have come to expect over the past few years, so how could you adapt your session to reach its objectives in a more engaging way?' Give them some coaching, listen closely when they hesitate or push back, and assist them through whatever is causing them to hesitate."